The opening weekend of trout season on the Michigan Au Sable River was the first time I was aware that caddis flies were a viable trout food. It had been an early spring and when the traditional opening day arrived on the last weekend of April the Hendrickson hatch was nearly finished. A hatch of Little Black Caddis [Chimarra aterrima] blanketed the water and I experienced a baptism by fire as I scrambled to concoct a suitable pattern for a hatch I had previously ignored. This incident occurred over 40 years ago and it gave me an introduction to a class of insects that has provided me with many hours of great angling opportunities. It is likely that caddis flies were the insects that allowed fly fishing in America to originally be viewed as an acceptable method of catching trout. Most of the early wet fly patterns imitated emerging or drown caddis flies. They were mostly drab colored flies, and had wings tied over the back or along the sides, which is a pretty good imitation of a caddis fly. While mayflies get most of the glory it was likely the moth-like caddis fly that served as the original catalyst for fly-fishing in North America. Caddis flies belong to the order Trichoptera, meaning hair winged. Closely related to moths and butterflies they have two pair of membranous wings that are covered with tiny hairs. Unlike mayflies, caddis flies have a complete metamorphosis. In the larval stage many of them construct elaborate cases made from a variety of materials. Some just like to run around naked. Like their close relatives they have an extended larval stage, and then they spin a cocoon and transform into an adult insect. Once this transformation or metamorphosis is complete the adult insect swims or crawls to the surface where they complete their life cycle by finding a mate and laying the eggs that will bring about the next generation. Unlike mayflies, a hatch of caddis flies is a pretty straight forward operation. The adult insect either rises passively to the surface in a bubble of oxygen or swims rapidly to the surface. In either case once the surface film is penetrated the insect abruptly flies away. Some of the large species, especially several lake dwelling species, will run across the surface of the water after emergence, but most species pop to the surface and fly away. Some species will ride the surface for a short distance before they fly away, but normally the time spent on the water after emergence is minimal. This hatching activity gives rise to splash and often violent rise forms as the trout attempt to capture the adult before it flies away. Safely away from the water they rest in the streamside vegetation until they are ready to mate. Mating flights normally form over areas adjacent to where they hatched. Caddis flies generally do not mate in the air like mayflies, but leave the swarm and mate on the ground or on vegetation. Depending on the species females lay their eggs by dropping an egg sack, skimming over the surface depositing their eggs by dapping their abdomen on the water, or crawling under water and laying their eggs on the rocks. For the angler, caddis hatches present a great opportunity to experience some exciting angling. Caddis offer something for everyone; the larval and the emerging pupa stages will challenge the nymph fisher, and the adult caddis will challenge the dry fly angler, and, in the case of the diving egg-layers, a challenge for the wet fly angler. Fortunate is the angler who is well versed in all types of fly-fishing. If you desire to fish the larval imitation it is helpful to have some idea what type of caddis exist in the water you are fishing. This can be easily accomplished by picking up some rocks from the streambed and examining the aquatic vegetation. 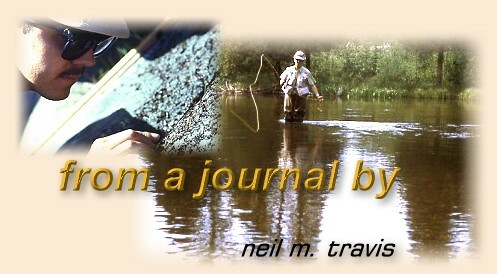 While it is possible to imitate the case builders the free ranging caddis larvae are more readily taken by the trout. These imitations must be fished right on the bottom since the larvae are unable to swim, and when dislodged simply roll along the bottom until they can grab onto something. The most exciting fishing occurs during an emergence when the newly hatched adult is swimming or rising to the surface. Success during this phase will only be assured if you imitate the appearance and actions of the emerging insect. A small aquarium net or a small portable seine will allow you to capture some of the emerging insects. By watching the rise types you can generally determine if the hatching insects are active swimming quickly to the surface  or passive  floating to the surface in a bubble of air. Swimming emergers encourage the trout to rise vigorously while trying to intercept the emerging insects before they reach the surface. The more passive emergers allow the trout to be somewhat leisurely. There are many fancy patterns you can use to imitate emerging caddis but I have found I have the best success with basic soft hackle patterns. They are easy to tie, which I like because I am basically lazy, and I can alter my presentation and retrieve to imitate either the energetic emergers or the more passive type. During a caddis hatch I like to use a dry adult imitation with a soft hackle attached to a dropper tied to the bend of the hook of the dry fly. It's a real kick to catch a trout on both flies at once. For adult caddis imitations I find the basic elk hair style is hard to beat. By altering the size and color you can imitate nearly any adult caddis you might encounter. You can skate them, dead drift them, and even bounce them on the surface. They are easy to tie, again a plus, and they are very durable, another plus.